Now that my mate’s two-legger is staying in our den, I’m not quite sure what to make of it. My spotted queen assures me that she is well trained, but I still have my doubts. She spends an awful lot of time staring at nothing of particular interest. At least the light box provides the amusement of small noisy two-leggers that can be threatened with a mighty hiss, and when the wrinkly one is busy staring at it, she creates a lovely warm comfy spot on the top of her legs for my napping pleasure. But this behavior is not beneficial to kitties at all. And that wet stuff she’s enjoying really curls my whiskers, it smells so bad! …I think it is time to give this two-legger the ultimate test. And if she fails to pass and gain my approval… then her sleeping place has just become my new sand box until she gets the message and leaves my territory. It really is quite simple. And… belly is up! I repeat, the belly is up! …You have chosen wisely, two-legger. It would appear that my mate has indeed trained you well. …And your backstroke technique is above average. I’d give it a solid 9.2. …All right, two-legger, you may stay. But, at the end of the day… you still can’t compare to my two-legger. I have trained her well in the art of catnapping… and there is no better comfy place in the world than stretched out on her warmth, under her wrinkly paws. Perhaps, in time, you can become almost as good as the wrinkly one, two-legger. Aw!!! So happy to see this pop up. I laughed out loud “the belly is up!” Haha! I know a cat that does that all the time, and yeah – nothing compares to a napping human. Hahaha, yes! Because how can you resist that? Makes me think of this stand-up act by Ellen DeGeneres on Procrastination, where she talks about being sidetracked for 45 minutes by a kitty with the belly up. hahahahha – oh kitty bellies. 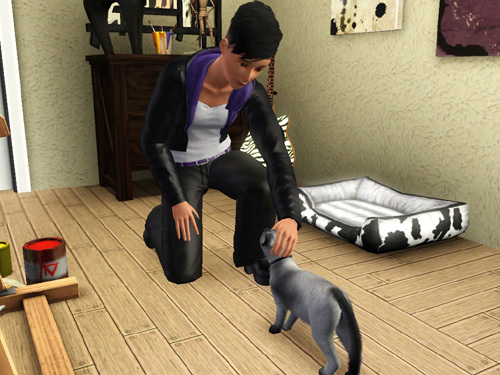 I would really like to make Caturday updates a thing (though I’ll be on vacation next week so I know that won’t happen), I’ve just been having a hard time finding the time to get in game and actually play since I started Weekly Reading Roundup and my Daily Persistent Headache condition has been quite bad the last few months. But yes… I am really hoping for Cat Chronicle Caturdays as soon as I’m back from vacay. 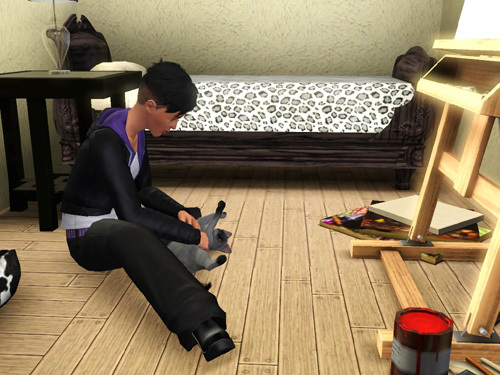 Am I the only one simmer who when she sees her 3D cat doing this she did absolutely nothing lol.I let Mi (it’s a nickname in fact) playing in the floor because she’s a playful Princess and she always rolls on the floor when my simself come back home.I love my 3D cat more than myself lol. And by the way how did you do for letting sleeping the cat on the Wrinklyone belly? It’s so cutttte !! Mi never did this, she’s an adult cat perhaps that’s the reason why. 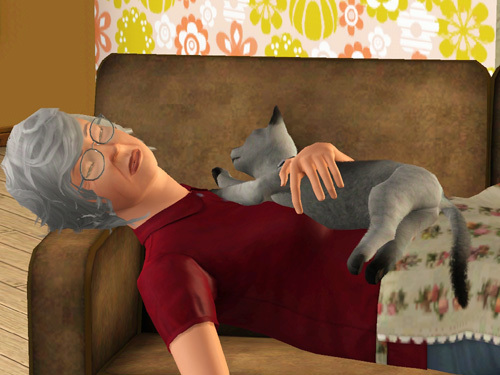 I used a custom pose to create the picture of Shadow and Wrinkly One sleeping together. 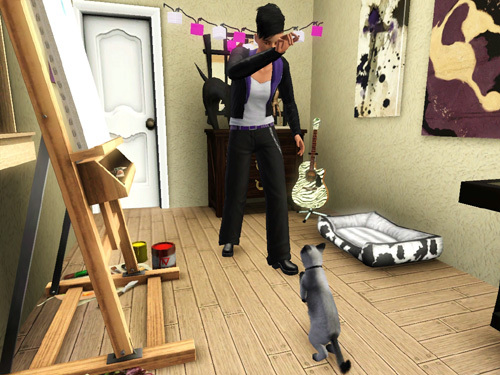 I believe the name of the pose set was “Pet Love” and once I’m home from vacation I can get the link, but at the moment I don’t have access to my computer with my cc links on it. But it is true, you can’t do that normally in the game. 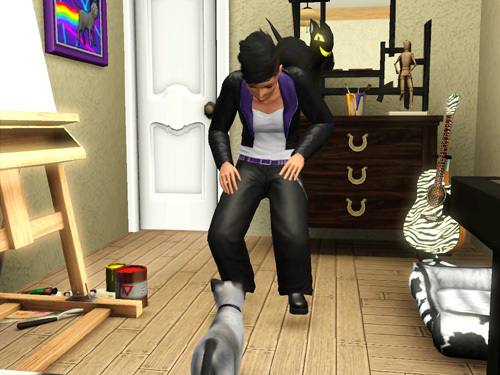 I don’t use poses very often in Cat Chronicles, but there are a few random chapters that I use custom cat poses (especially the really cute ones). 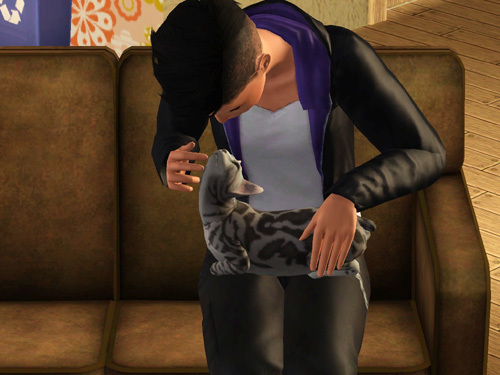 Thank you for the help darling.I rather asked you because I know Mi is sweet and she always want to climb on my simself knees when miss v is sitting down the sofa and I was surprised to see Shadow sleeping on Wrinkly One’s tummy. I also rarely use poses except for sims photography and it’s rare, my game is windowed and the time to catch my sims , searching for the pose player takes me so long .I don’t access to my ts3 also because I had recently reinstalled fully windows vista for the n times this month, I reinstalled TS2 only for now.Please take your time and enjoy your hollidays. I’m home and now have access to my custom content files. The pose used in the last picture is from Kima_Melon’s “I Love My Pet” pose pack, which can be found for download here! thank you sweetie for the link, I hope you enjoyed your hollidays. 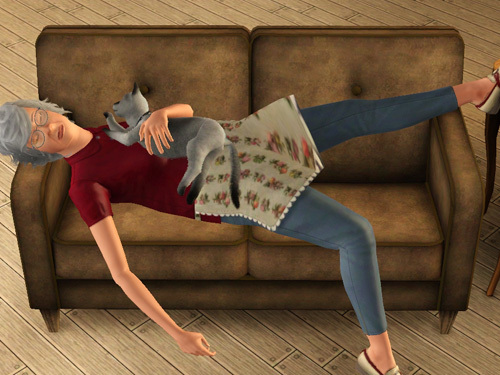 The pose at the end warmed my heart <3 It reminds me of my own kitty, who loves to curl up on my chest and catnap with me. Hehe. Lovely chapter! That’s the picture I use for my splash banner for the story because I love it so much… it just seems to encapsulate everything so much!